VBS Direct Ltd - Vet Testimonials - Innovative solutions for the veterinary professional. Here are some comments from KLaser clients in the UK. If you have already experienced the benefits of KLaser Class 4 Theraphy and would like to tell us about your experienced please click here. “The introduction into the practice has been an easy and straight forward transition and clients have seen and are grateful of the positive results. The team has been amazed by the effects of the K-Laser on wound healing, leading us to change our consent forms to an opt out option rather than an opt in to reflect this. Nurses were able to see obvious differences in those that had received K-Laser treatment in comparison to those who had not. All equipment received from the start was appropriate, although we quickly required a K-Laser stand to keep everything together and safe from damage. The K-Laser is permanently out on the side in the preparation area due to its continuous use by all team members. The K-Laser is very straight forward to use with the multitude of programmed settings suitable for varying sizes, species, areas and conditions for treatment. As we continue using the K-Laser I can see that there may be a requirement for staff to learn more about it, but I have seen that there is a course available by an external provider in collaboration with VBS that may be appropriate. Training at instalment was excellent for all with regards to the various uses and science behind the K-Laser. 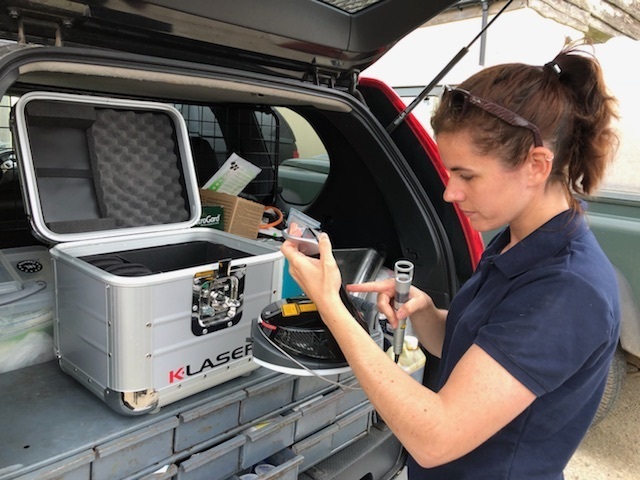 On-line modular training allowed all users of the K-Laser to ensure that they were aware of health and safety implications. Practical elements of training have been provided when Stephen has been in the practice. Local laser safety rules were provided as a template to ensure health and safety protocols were followed so that all that was required by the practice was the completion of a risk assessment. "Apart from the initial consultation and follow up assessment near the end, this is an entirely nurse lead team. My highly qualified nurses are able to spend time with each patient and see the improvements with the owners over the sessions, this has benefits for all aspects of the services we offer small animal clients." 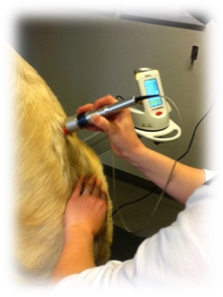 Susan Holt RVN from Macqueen Veterinary Centre discusses her experiences of using K-Laser. 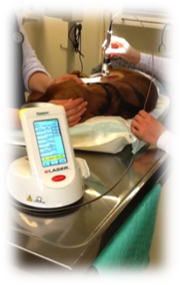 Oundle Vets have been using a K-Series therapeutic laser since July 2012. 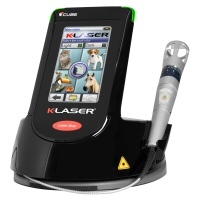 This video gives a vet nurses perspective on using the K-series laser in practice. 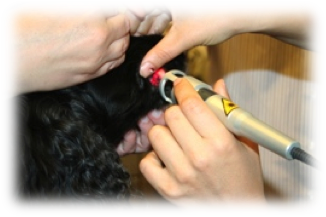 It highlights the benefits class 4 laser therapy brings to the pets, client relationships and practice as a whole. Mr. James Bigglestone MRCVS and Miss Jo Williams RVN, Village Vets, North Wales. Lisbeth Lester MRCVS, Lester Pet Care, Wigan, Lancashire. “This absolutely amazing little machine (and it is indeed quite small) is delivering the most fantastic results in the treatment of loads of different conditions. We had arthritic dogs who could not move around pain free even on two different painkillers now being able to jump up again and cats finally being able to venture out into the garden again. It helps against skin infections, speeds up wound and fracture healing, can be used for cats with chronic gingivitis and a whole range of other problems! 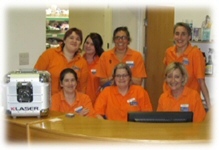 Billa Schleicher MRCVS, All Pets Vet Care, Milford Haven, Wales. Martin Gabbutt MRCVS, Abbeydale Vets, Blackburn, Lancashire. “We are really enjoying having the K-Laser in our hospital for wounds and post-surgical use. Over 2/3rds of our operations are having it as standard treatment, including all our neuters, as we offer it at a very competitive price. We, and the owners are seeing improvements across the board, and our owners are spreading the word about the laser and its effects, so recruiting new cases is easy. On chronic wounds and lick granulomas we have had great results and owners are so relieved to have a treatment option after years of struggling to cope. Also lacerations and nasty abscesses, and especially cut pads we have had fantastic results with complete healing in 2 ½ to 3 weeks instead of the usual 5-6 week period. This reduces a lot of stress for us and the owners. "I have become increasingly interested and excited about the K laser. I believe it to be the treatment of the future and its many benefits are being discovered almost daily. Laser energy increases circulation, drawing blood & nutrients to the area, where the laser then stimulates the release of oxygen to the damaged tissues, creating an optimal healing environment. The laser also increases energy at the cellular level and reduces pain and inflammation by a direct effect on the nerves." "We are proud to be one of the very few vets in the whole of the South West to offer this treatment and have made it surprisingly affordable. It is a huge success with our clients, especially for helping to treat arthritis and speeding up healing after surgery." Medivet Forest Lodge Veterinary Centre, Forest Row, East Sussex. We have had the klaser for approx. 2 years at GUVS and we use it on every patient we see through the physiotherapy / hydrotherapy service as all patients present with some element of pain / inflammation. We have had very good results for tendon (luxating patella) and ligament injuries (partial CCL tears) which were managed conservatively and did not require surgery. Previously when the partial CCL patients were rested then exercise was reintroduced the partial tear almost always became a full tear. The Klaser reduces inflammation (effusion) associated with the ligament injury and reduces scar tissue and the ligament heals with good fibre alignment giving strength and flexibility so much less likely to re injure the ligament. I think for the tendonitis type problems (lux patella) the laser acts in a similar way to cortisone injections. Once the inflammation around the tendon is controlled with the laser the tendon tracking is improved and the patella is stabilised. We also use the laser a lot for chronic condition such as Hip Dysplasia in my previous experience of these cases the HD would tend to remain the same and the progression of secondary arthritis was reduced with physio and hydro alone. Now I am finding with the addition of K-Laser therapy the patients are regaining almost 100% range of motion in the hip joint which was previously reduced to around 60% I also strongly recommend these patients also have a good joint supplement. Post-surgery the K-Laser is very good at enhancing wound healing. Again, if scar tissue is a problem over a joint surgery the laser is very good at minimising this. The cost of the laser treatment is absorbed into the physio / hydro session. However sometimes we see patients who only receive K-Laser treatment at this is priced at £15. If you explain the benefits of the laser therapy to your clients I am sure they will accept it. If you are using it on all your post-surgical patients, you could just incorporate it into the surgery price.